Nuts! The 510hp Stelvio Quadrifoglio is Nuts! There is literally no need to read on – buy it if you can. My 1830kg test car with a few options has an asking price of €127,095 so it safe to say it will be a rare sighting on Ireland’s road – but boy, what a sight. 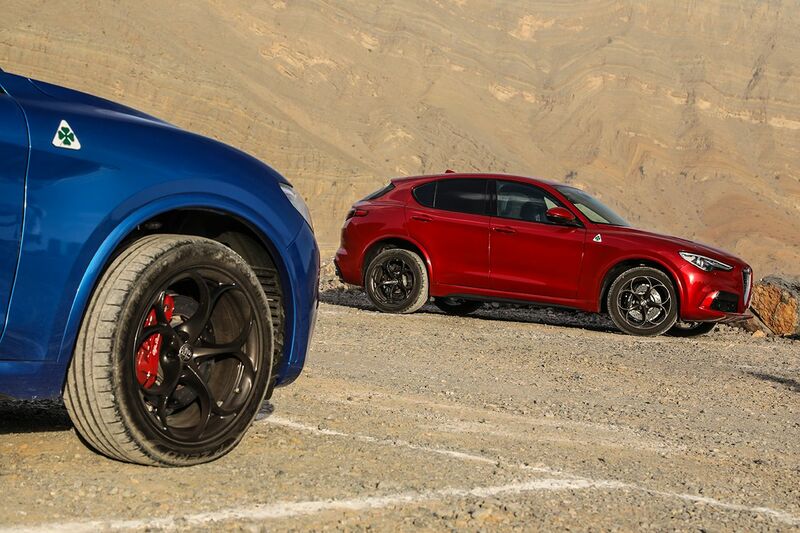 The Stelvio Quadrifoglio out performs numerous hot saloons with even the mighty M5, M4 and M3 all slower to 100km/h. 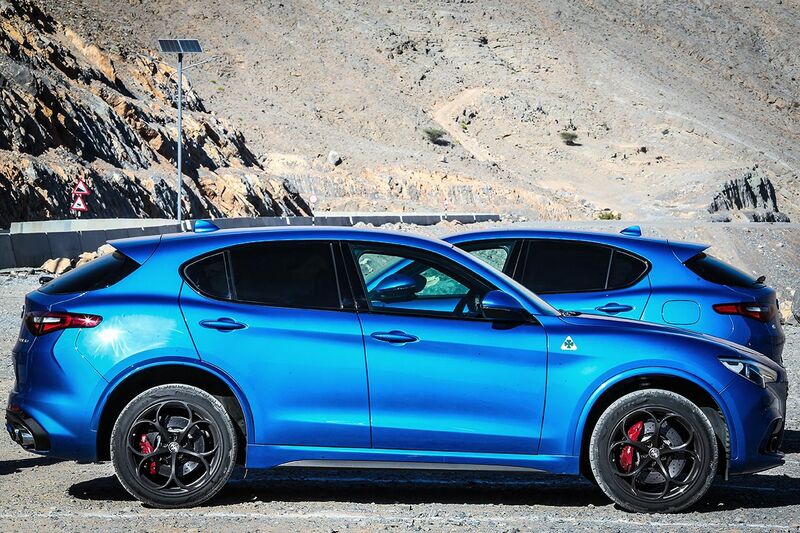 The humble Stelvio starts from €50,000 and is a very good driver’s car as far as SUVs go. 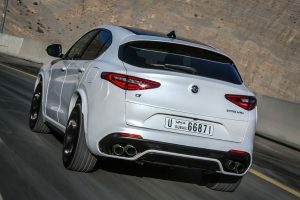 Put a Ferrari derived twin turbo 2.9 litre V6 petrol engine from the Giulia Quadrifoglio in the SUV and add Q4 four wheel drive and the result is simply bonkers. 0-100km/h takes 3.8 seconds – that’s blisteringly quick in a supercar let alone an SUV! The four leaf clover (quadrifoglio) SUV is literally a high performer in a world that wasn’t really asking for a high performance SUV. The red hot Stelvio proves buyers have gone mad as clearly somewhere demand exists for this type of high rise machine. The rear wheel drive Giulia Quadrifoglio is a brilliant car and one of my favourites. 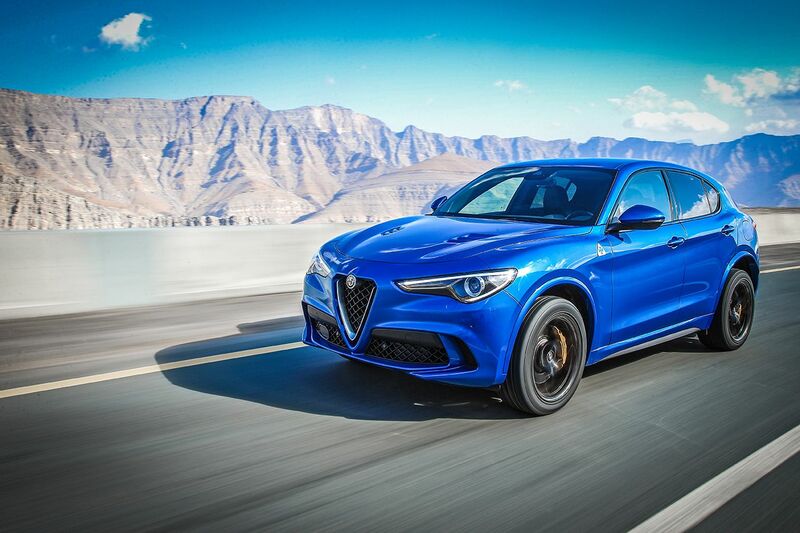 If Alfa had simply made the Stelvio Quadrifoglio rear wheel drive only the result would have been disastrous. Q4 all wheel drive ironically drives the rear wheels most of the time but can shift 50% of the power to the front in a heartbeat when needed. Q4 makes the Stelvio very grippy especially when taking off from a standing start. When cornering the tall machine delivers a quite interesting experience. Power out of a corner and you’ll giggle like a child! The exterior is a little shouty but not over the top. Inside the cabin has sporty features and carbon framed sports seats to make you feel you’re in something special. The cabin has a few bits of carbon and while its steering wheel and paddle shifters are great everything else is just average. The display screen is poor and the interactions required are annoying and not impressive for a car that costs this much. On the road the Quadrifoglio’s engine, drive train and automatic transmission are fantastic amd this is what you are paying for. There are a number of drive modes that remap throttle response etc. like ‘neutral’ and ‘all weather’ but ‘dynamic’ and ‘race’ are the ones you want. Huge alloys with sticky rubber coupled with big brakes deliver superb road grip. The fruity quad-pipe exhaust burbles deliciously especially in Race mode. 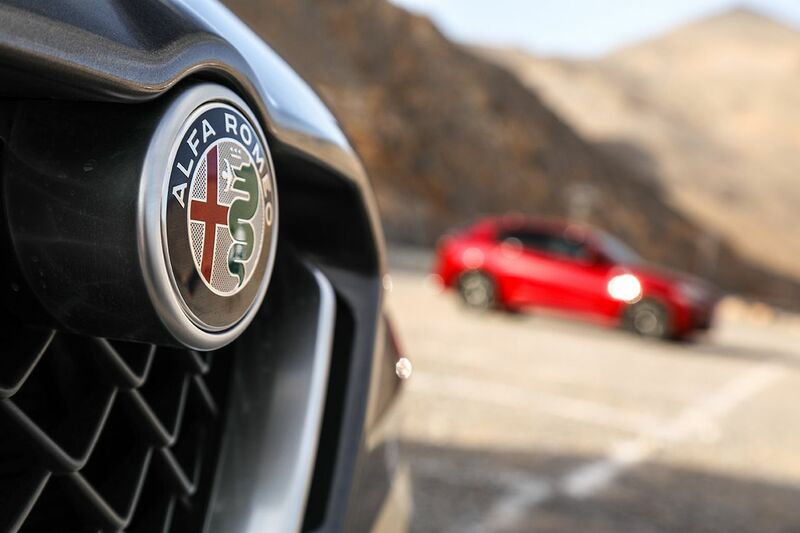 The steering is direct and razor sharp – one of the best things about the Giulia and Stelvio. Initially getting used to the Stelvio’s quick steering takes a bit of time as the car can feel fidgety. Guiding the SUV in its lane can be a challenge until you get your eye-in so to speak. The Q4 system and engine do a great job encouraging spirited driving. It’ pulls like a train too with 600nm of torque and is one of those cars that gives back a lot of feel to the driver. Top speed is 283km/h and as you might guess CO2 is not a strong point attracting annual road tax of €2,350 from its 227g/CO2. The Quadrifoglio’s performance numbers and driving experience cannot be matched and while it is flawed it is brilliant too. Sadly the thirsty beast will only deliver 470km to the tank – well that’s what it did for me! So long runs will be broken up with filling station visits – no harm I suppose. 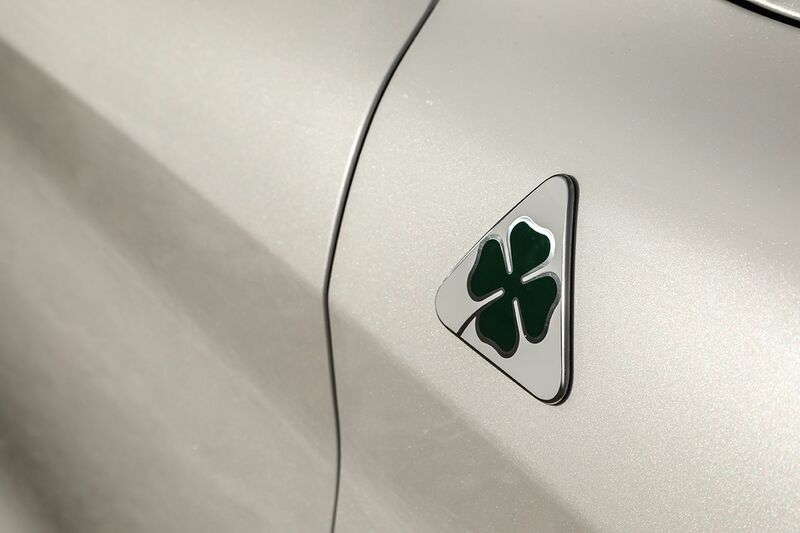 The Stelvio Quadrifoglio starts from €118,795. In summary, the Alfa Romeo Stelvio Quadrifoglio – see my first sentence!